The cap insignia and the pantaloons, or “gaiter-trousers”, of white duck are the give-aways. 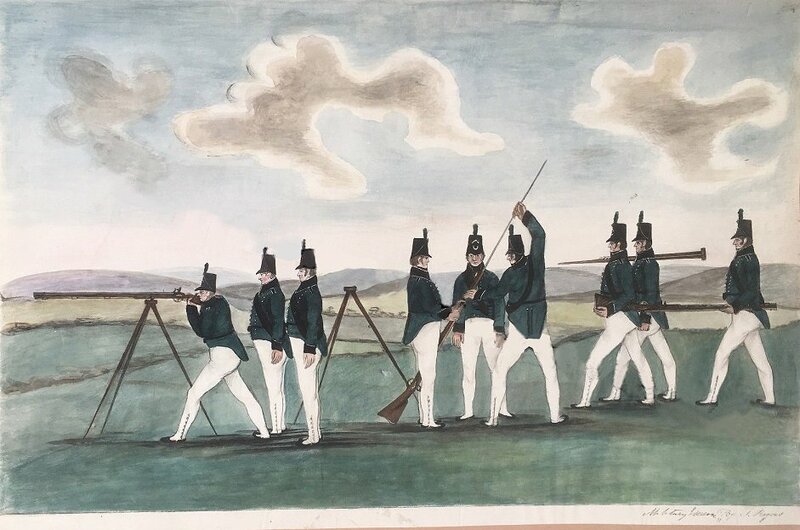 These solemn farmers in rifle outfits are the riflemen of the Percy Tenantry, that outsized and distinctly feudal legion of volunteers first commanded by Hugh Percy, Second Duke of Northumberland. (Their regimental roll, sealed in a glass tube, still sits within the foundation stone of the equally outsized and distinctly feudal memorial column erected in his Lordship’s honour in Alnwick in 1816.) Massively out-legioning the rival Cheviot Legion of Northumberland, the Tenantry by 1805 had ballooned to six troops of cavalry, a company of flying artillery and a full seventeen companies of rifles. A surprisingly large quantity of their bits and pieces still survives, providing a highlight for visitors to Alnwick Castle. The painting is captioned at lower right in one hand “Military Exercise”, and in another “By T Rogers”. On page 435 of the first volume of Mackenzie’s Historical, Topographical and Descriptive View of the County of Northumberland … of 1825, appears a brief input on the neglect of local harbour facilities by “an obliging correspondent, Mr Thomas Rogers”. As an keen observer of the local scene, Thomas Rogers of Long Houghton, then a “straggling village” just four miles from Alnwick, may have been our mystery watercolourist. To be frank, Toppin didn’t think much of the guns at first. They started practising on Alnmouth sands on 19 January 1807. The first day was not a success. ‘The weather and sea being rough we could not find a single ball’. However, as they gradually got used to the guns accuracy improved, though the weather did not. Firing 135 rounds a day on one occasion they put 56 balls into the six foot … square target at 300 yards … On another day they only managed 39 but there was some excuse. According to Toppin the weather had been ‘extremely tempestuous. The snow drifted so much that often we could not see the Target’. Toppin himself was eventually convinced of their effectiveness and wrote that at 300 or 400 yards ‘the Wall Pieces would do dreadful execution’. Immediately after divine service, the salute commenced with 7 guns from the artillery, which was followed by all the wall pieces, and a feu de joie from the cavalry drawn up under the castle, and afterwards from the riflemen on the walls and top of the castle, which was succeeded by three cheers, and then a flourish from the bugles in the flag tower. This was twice repeated, completing the royal salute of 21 guns; after which the troops and companies returned immediately to their several places of muster, where dinners were provided for them. Pleasing to see that, as on all proper volunteer occasions, the proceedings were rounded off by a good meal. Another plug with tags, for three more new pages here. Normal posts will be resumed as soon as possible. Two pages on more volunteers of 1803 – infantry volunteers of Cheshire and infantry and artillery of North Yorkshire. The 1790’s Gloucestershire page includes Bristol volunteers, but the 1803 Gloucestershire page doesn’t, purely for reasons of space. (A Bristol 1803 page could appear somewhere down the line.) The 1803 Warwickshire page includes Birmingham. Volunteer infantry, infantry associations, rifles and some artillery corps are covered here, but yeomanry and association cavalry are not. Stretches of these pages are a bit thin in places, mainly where info on small and obscure one or two company corps, based in a village and officered by the local squirearchy, has been lost to time. But the city entries tend to make up for that, and I hope the pages will be a useful resource. If I can add to them, I will. Links also appear in the usual places – up above and in the right hand margin. For the Local Militia, pages on East Yorkshire and Worcestershire. And the start of a new set on the volunteers of 1803, beginning with Manchester and West Yorkshire, with a brief introductory page here. Not the last word on their subjects, by any means, but they’re a start. And with more areas to come, as time allows. Meanwhile, existing pages have had small updates from time to time. As usual, links to pages from Home are either by the tabs up the top, or the Page listing at the right. Sample slide show below. As a National Trust member I’m generally approving, though (as they say) with reservations. I’m not sure about some of the narratives the NT spins to brand its stately homes, especially the way those narratives can sit light to the sources of the wealth and power that built the estates – slavery and land clearances for a start. But then again, the NT does have some real treasures in its custody. I took some fairly useless snaps with my phone and trotted off to have a word with a member of staff. The volunteer attendant I buttonholed seemed sceptical about my revelation concerning the impostor hat, and, overall, politely indifferent. Later, I wrote to request a proper viewing, quoting my NT membership number, but never had a reply, just as I’ve never had a reply from Powis Castle about the yeomanry standards they have in storage. Well, people are busy and resources are tight, I suppose. But a bit of a low peak, all the same. Even allowing for the inclination of volunteer corps to dress their other ranks in superior grades of clothing, this doesn’t seem to be a private’s jacket, and there are no light company indications. It must surely be an undress garment, worn as an alternative to the officer’s coat? Or were the battalion’s officers universally in jackets for dress? Whatever the case, it’s a fine little item. By the way, don’t go looking for it among the nearly one million items on the National Trust Collections site; it isn’t there. Postscript – Man in Hat identified! I am pretty sure that the sergeant in the painting in “Who’s this? And what’s that hat?” is a member of the Northumberland Militia c 1803. See an image of the plate in JSAHR Vol 66 (1988) Page 97. 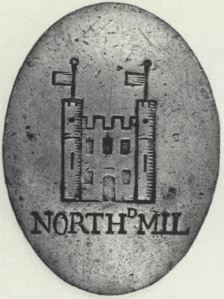 The castle shown on the belt plate is Alnwick. The facings of the Northumberland Militia was light buff. And so indeed it proves, and here’s the plate in question. “NORTH” is actually “NORTHD” for Northumberland. The character of the hat is still a curiosity. While the black belt suggests that the Colonel accepted the tan leather accoutrements supplied by the Ordnance to Militia, rather than replacing them with whitened buff, as many did. And I still wonder why a sergeant would have had such a professional portrait done. Is he a figure of significance? Here’s a characterful little portrait – almost Falstaffian – lifted from the Art UK site, but held at Scarborough Art Gallery, where it is titled as “Major Tindall” and dated to circa 1745. That’s half a century too early, I think. Nor is this an officer. 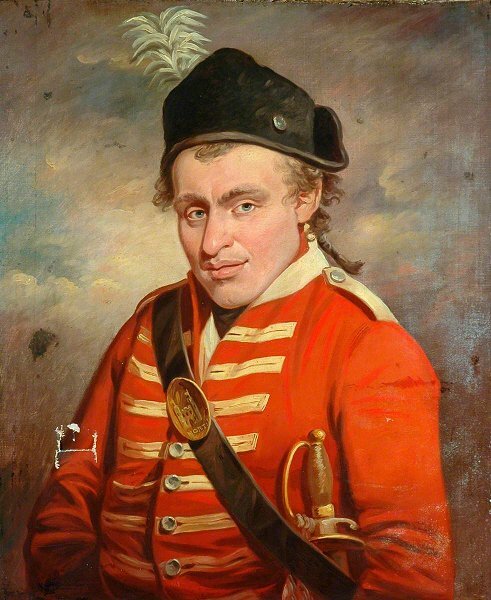 And the Lieutenant Colonel Tindall who commanded the Scarborough Volunteers of 1794 and 1803 (if that’s the thinking here) would have worn black facings. So who is it? So, a sergeant of the North Holderness – well, maybe, though I could be well off target. But the whole effect is strangely agricultural. Wouldn’t you button up your jacket for a portrait? And how many sergeants could afford to have themselves limned for posterity, and by quite a competent painter, too? And what’s with the hat? Were no dress caps available? It has the look of an old hat cut down for a forage cap, with just a flap surviving to fold up at the back. So why the lone button at one side, and the feather (and cockade?) at the other? And was a castle emblematic of the Holderness area? In the unlikely event that anyone stumbling across this can shed any further light, I’d love to hear about it. An overall introduction, with much solid general information, can be found here. Often disregarded as the boring tail end of the volunteer movement, the Local Militia regiments present their own challenges and surprises. I don’t recall ever seeing a surviving Local Militia garment that wasn’t an officer’s – hardly surprising, as this clothing was not retained by the men but handed back into storage after each training. On the other hand, the dress followed the patterns of the existing county militia, so reconstruction is perfectly feasible. 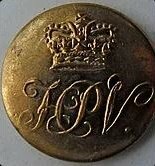 Having said this, buttons, plates and some other aspects were mostly specific to individual regiments, so the field is not without variety. These pages are very much work in progress, and some gaps will be obvious. Corrections and new information will be put in whenever possible.